Abstract: In this thesis, two types of electromechanical transduction materials/structures were studied, including the nano-patterned electrode and alternating current electrical field poling for enhancing the properties of PMN-PT single crystal and candle soot nanoparticle composite transduction for photoacoustic evaluation. With a brief review of ferroelectric relaxor-PT single crystals, the fabrication and development of nano-patterned electrode was presented. The piezoelectric properties measurements and domain observation results suggest that nanocomposite electrodes are promising for domain engineering of PMN-PT single crystals. The other domain engineering method we studied is ACP. Compared with the traditional DCP method, PMN-PT single crystal with ACP method exhibits 20% higher dielectric coefficient, piezoelectric coefficient and smaller domains. For the photoacoustic transduction material, we propose an efficient broadband light absorption material, candle soot nanoparticles. Combining with PDMS, the energy conversion efficient composite was fabricated. The major accomplishments in domain engineering and photoacoustic transductions are summarized, followed by the future work suggestions. Biography: Wei-Yi attended the National Cheng Kung University and graduated in 2008 with a B.S. in Civil Engineering. He earned his M.S. degree in Mechanical Engineering from National Taiwan University. Following graduation, he was accepted into Academia Sinica (Taiwan) and North Carolina State University (MAE department) as a research assistant for one year, respectively. 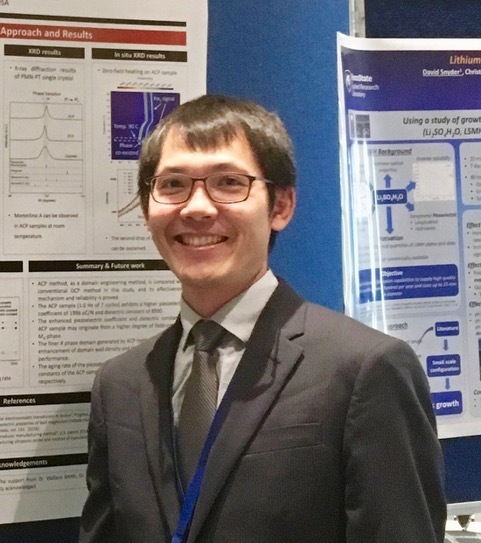 In 2014 he began his studies toward a Ph.D. in Mechanical Engineering at North Carolina State University under Dr. Xiaoning Jiang and Dr. Chih-Hao Chang. His research interests include micro/nano fabrication, and ferroelectric single crystal.